The actor who stared in the “Leave it to Beaver” television show is in Iowa today to tell Iowans how they can get free prescription drugs. 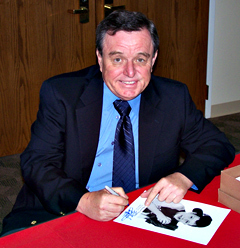 Jerry Mathers accompanied the P-P-A orange bus on a stop in the Des Moines suburb of Urbandale. “There are a lot of Americans right now that are uninsured and struggling. And what the P.P.A. bus is, it’s Partnership for Prescription Assistance. And it’s for people that are uninsured, have a chronic disease, to be able to get their medications for free or almost free,” Mathers says. Mathers says you can visit the bus, or you can contact the P.P.A. to see if you qualify. Mathers says you can call 1-888-4-P-P-A-N-O-W, or you can go on-line at:www.pparx.org, and they will ask you about 10 questions to see if you might qualify for the free medication. He says it’s important you check to see if you might qualify for help from P.P.A. Mathers says there are some 400 companies, around 200 are drug companies, and the others involved supply grants — so it’s important that you call and see if you qualify. He says any information you share is kept anonymous. Mathers has diabetes and says the disease has showed him the importance of staying up with the proper medications. Mathers says he’s lucky to be covered by insurance because of his acting, but says he knows that not treating a chronic disease with the proper medications can make things get even worse. So he says anyone who needs help should check to see if they can get their medications for free or almost free. The P.P.A. says it has already helped over 54,000 people in Iowa. The bus is scheduled to visit Ames, Cedar Falls, Cedar Rapids, Iowa City and Burlington. Mathers, who played the “Beaver” on the iconic show, was born in Sioux City and stayed a short time in Iowa before moving with his parents to California.